The NPcatalyst team has designed a tool which takes a virtual snapshot of a company’s community connection. 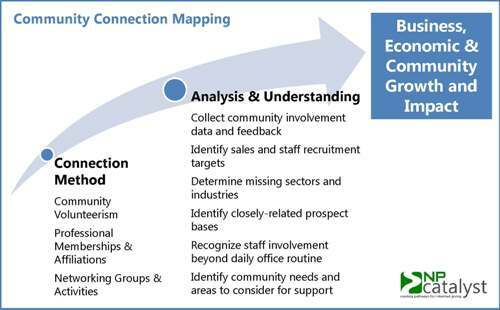 Through our Community Connection Mapping product, clients receive a “map” of their community leadership. The goal is to empower community engagement, generate increased revenue, and foster economic growth. Do you wonder where your staff members volunteer in the community? What about the professional membership and affiliations or the places they network? Do you recognized employees for their community involvement? Have you ever considered volunteerism as an avenue of corporate growth? Have you leveraged your company’s community engagement for positive brand awareness? We’ll design the strategy which best fits the company’s needs and wishes. Contact us to learn more about how conducting a Community Map can impact your business’s bottom line. We can be reached by email and phone (775-333-9444).